We have been making stairs since 1895 - and our highly skilled craftsmen are still leading the way in staircase manufacture today. We keep up with all the latest cutting-edge innovations, and have even developed the technology to make curved and splayed stairs. Our dedication to detail and consistency is second to none, with components being thoroughly checked at every stage of the manufacturing process to ensure a top quality product every time. What’s more, you can be sure your staircase will fit like a glove. All products are dry-fitted in our factory before being sent out, to make sure there are no nasty surprises when it comes to installation. 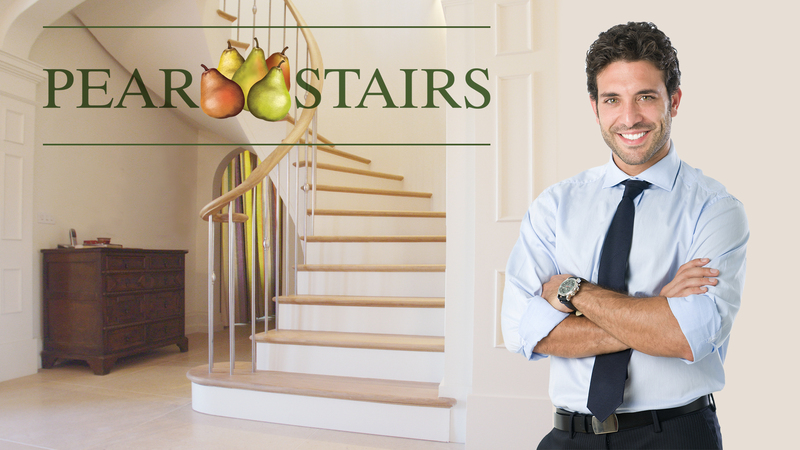 Pear Stairs offers a truly personal service. Whether you’re looking for contemporary metal and glass, classic ash, timeless pine or traditional oak, we will be able to come up with something stunning to suit your home. 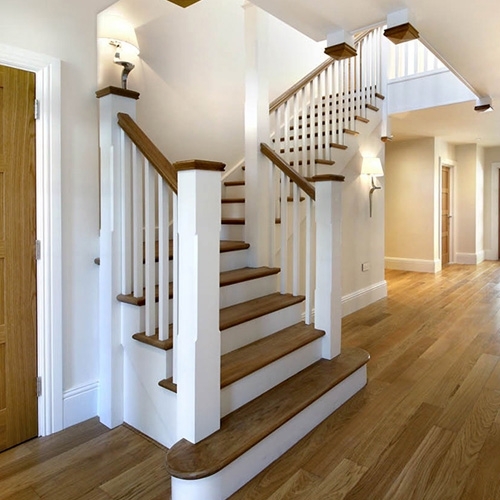 Our experienced stair designers are always ready to help with any problems that may crop up during the planning process such as awkwardly placed windows and doors, building regulation conflicts and sharp turns. Even a basic customer sketch can swiftly be transformed into a complete design to meet individual requirements. You are welcome to talk to the designers online during office hours by clicking on the live chat button at the top of every web page, or by calling Pear Stairs on 01938 553311. We are able to produce staircases to suit every budget and taste, at extremely competitive prices. 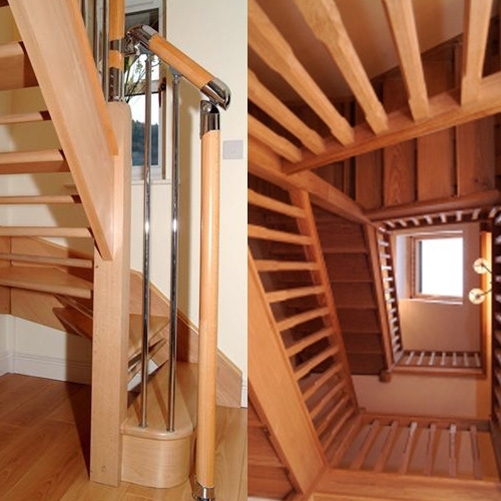 A standard straight flight of whitewood stairs, for example, can cost less than £400. Moreover, we won't charge you for alterations to the design along the way, so you needn't worry about any hidden charges. Our expertise can also save you money. If your budget is limited but you still yearn for a luxury feel, we can recommend more economical timbers such as idigbo or sapele, which can be stained to give a premium look for a fraction of the price of oak or ash. Likewise, you might choose cost-effective MDF treads and plywood risers if the stairs are going to be covered in carpet - that's how flexible we are. At the top end of the scale, a 100% oak or walnut staircase may set you back between around £4,000 and £13,000, depending on size and design. However, it will add far more than this to the value of your home, as well as providing a beautiful focal point that you can enjoy for years to come. In most cases we will be able to manufacture and deliver your staircase within 7 to 10 working days after receiving the confirmed drawings – a super-fast service. Sometimes it takes even less time than this. Even a complex bespoke design is normally ready within only three to four weeks. This is made possible by our 24-hour shift pattern, with our production team working round the clock to keep up with the high demand. What's more, as a national company we can deliver anywhere in the UK. Look out for our colourful fleet of customised vehicles gliding along highways and byways up and down the country. Both standard and individual designs are available, with something for everyone. We offer a great choice of timbers including oak, ash, pine (both Scandinavian and southern yellow), sapele, walnut, idigbo and hemlock. We also supply a white primed option, which can save valuable surface preparation time on site when the stairs are to be painted. As the timber has already been treated with primer, you will just need to apply an undercoat and top coat. 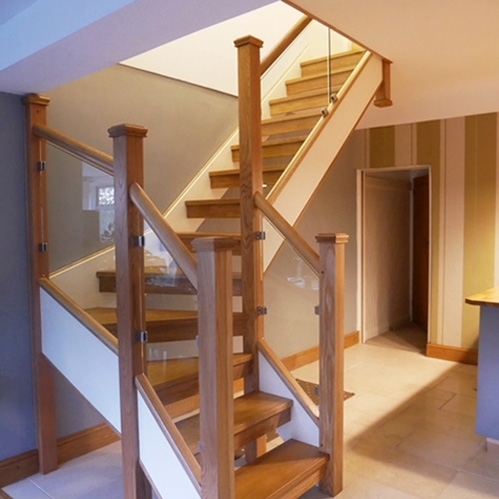 If you don’t require a complete staircase but only want to change the balustrade, individual stair parts such as handrails, spindles and newel posts are available through our online shop. Just send a quick sketch of your staircase and a finished floor to finished floor height and we will return a quote within 48 hours. You can fax your enquiry to 01938 555885 or email webquote@pearstairs.co.uk. If you have any questions, our designers are ready to help on 01938 553311. Alternatively, have a play with the StairCreator, our web-based planning tool. You can try out different designs, specifications and materials, and receive an online quote within minutes. Many more quality staircases are featured in our Case Studies pages. These case studies include a whole host of examples, photographs and design drawings, as well as testimonials from satisfied customers. We believe our clients deserve the tools to design the staircase they want, regarless of budget.